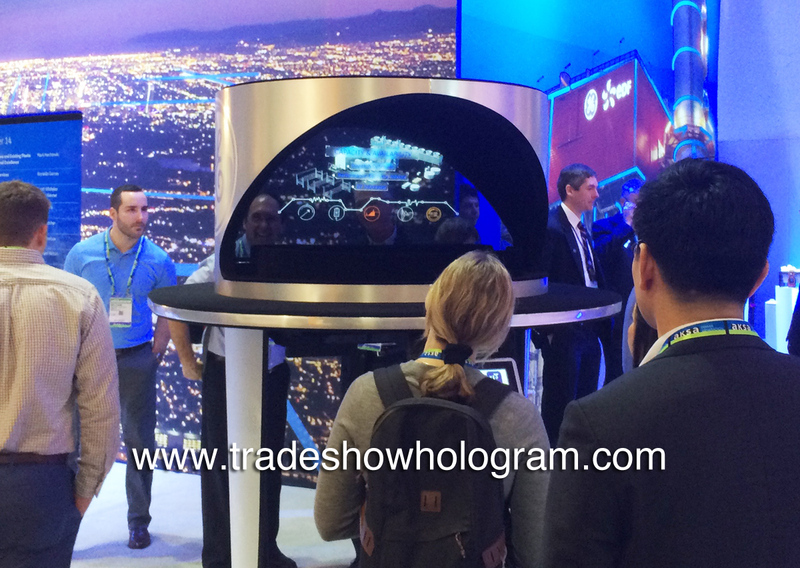 Interactive 3d hologram projectors proved a popular draw at Power Gen International 2016 as two exhibiting booths utilized the projection systems to attract attention, educate and inform trade show visitors. A selection of 3D holographic presentations can be called up on demand via the interactive touch screen built into the display. The dual sided display offers viewers the ability to watch and hear a separate presentation on either side of the exhibit without interfering with the opposing presentation. PGI 2016 was held at the Orange County Convention Center in Orlando FL. Hologram projector at Power Generation International 2016 GE booth. This entry was posted in New Trade Show Exhibits and tagged 3D, attraction, exhibit, GE, hologram projector, interactive, occc, Orlando, PGI 2016, power gen week, touch screen, trade show by TimothyDrake. Bookmark the permalink.